The Greek Revival style was a taste popular in America in the first half of the 19th century. Those in the South were particularly handsome, quite often designed with high ceilings, generous windows, and vigorous classical details. 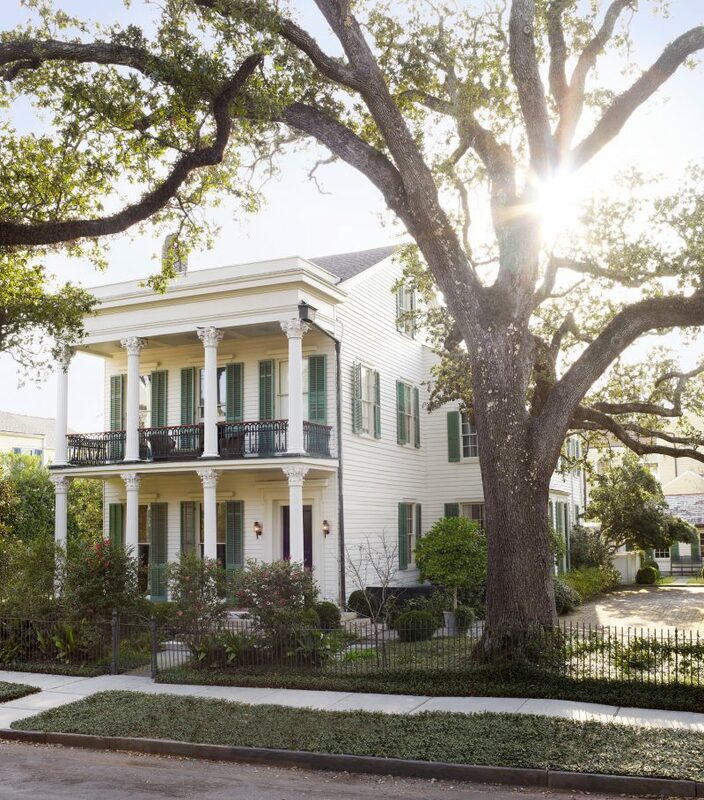 This house, owned by longstanding clients Julia Reed and John Pearce, is an especially attractive example, set in the beloved Garden District of New Orleans. Greek Revival houses can be a challenge for historical purists. Earlier and later periods of American design have more direct application to contemporary American taste than the original decoration of houses like these. They were often grandly patterned and ornate, and arranged with massive “pillar-and-scroll” mahogany furniture. For Julia and John’s house, there was no appeal in creating any archaeological approximation of its original appearance. 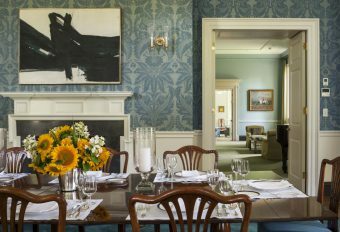 Conversely, most contemporary furniture is too small and delicate for the large scale of these rooms, and Julia and John, who are generally drawn to traditional decoration, would not be inclined towards it. In essence, to make a contemporary decoration in a Greek Revival house requires a certain level of invention. 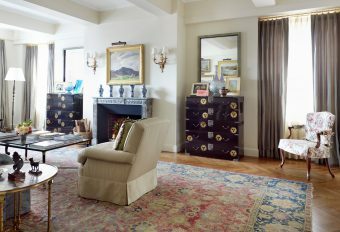 With these parameters in mind, we suggested to Julia and John that color would be paramount, as well as using an assortment of 19th-century furniture with pleasing proportions. This combination creates a successful balance in rooms that are somewhat traditional in style, and also youthful and forward-looking. 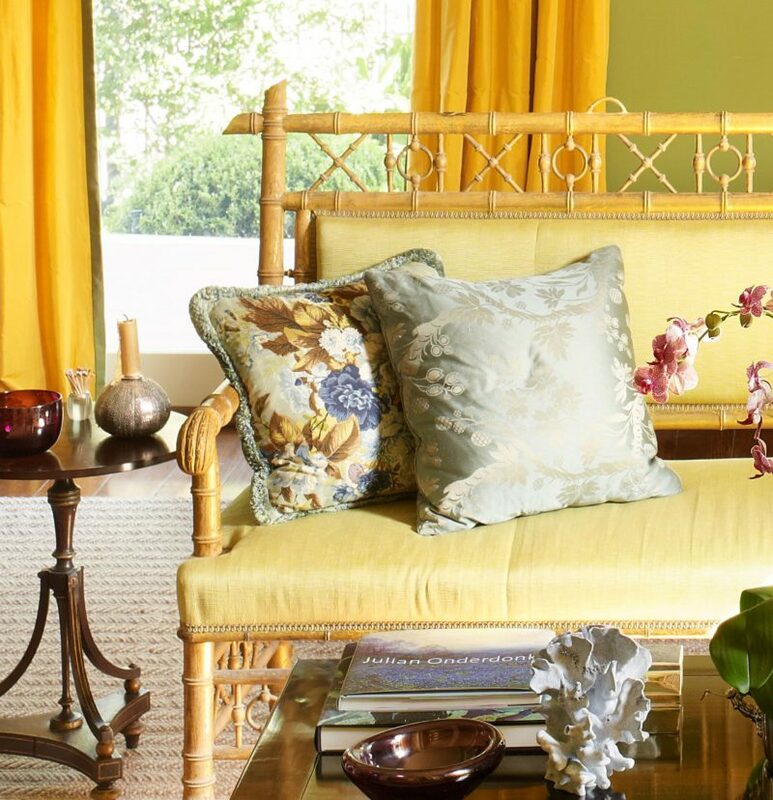 In the front parlor rooms, we devised an old-fashioned combination of green and yellow, derived in part from vintage chintz from the archive of the Parisian fabric house Le Menach (seen on the matching pair of pillows on the settee). 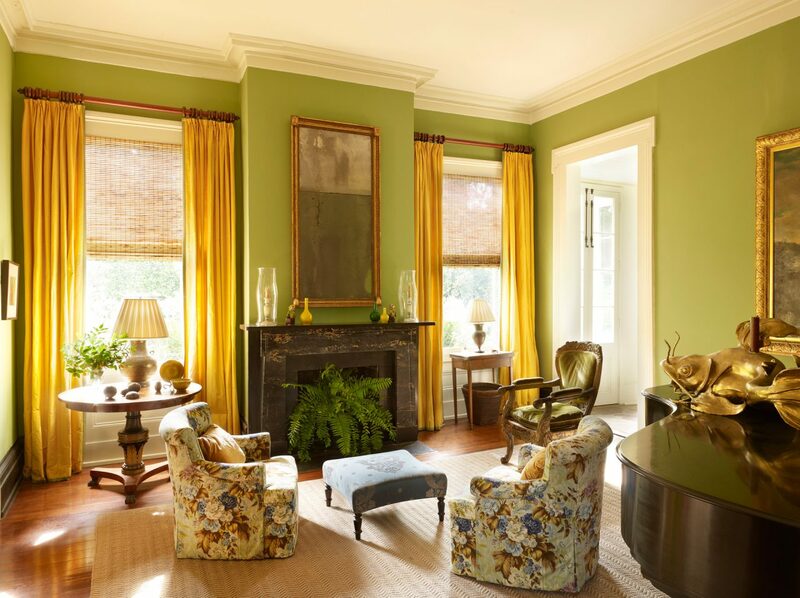 The handsome shade of bright green on the walls in the double parlors is balanced by curtains of yellow silk with green fabric flanges. 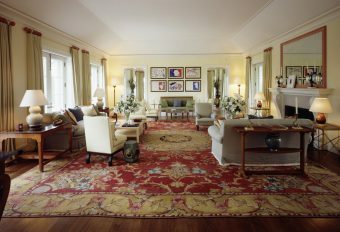 The front parlor is anchored with a pair of English Regency benches and placed on a beige mat, also made of silk. 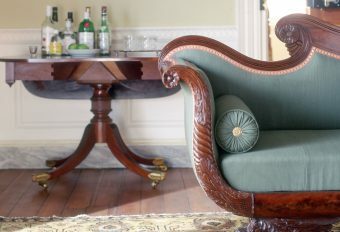 The Regency benches are covered in a pale green silk and their rich detail add a great deal of decoration to the room. 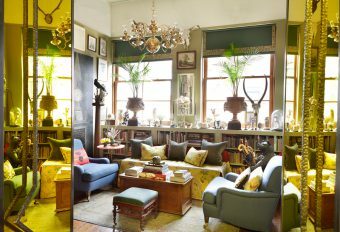 Both parlors have black marble mantels that are original to the house. 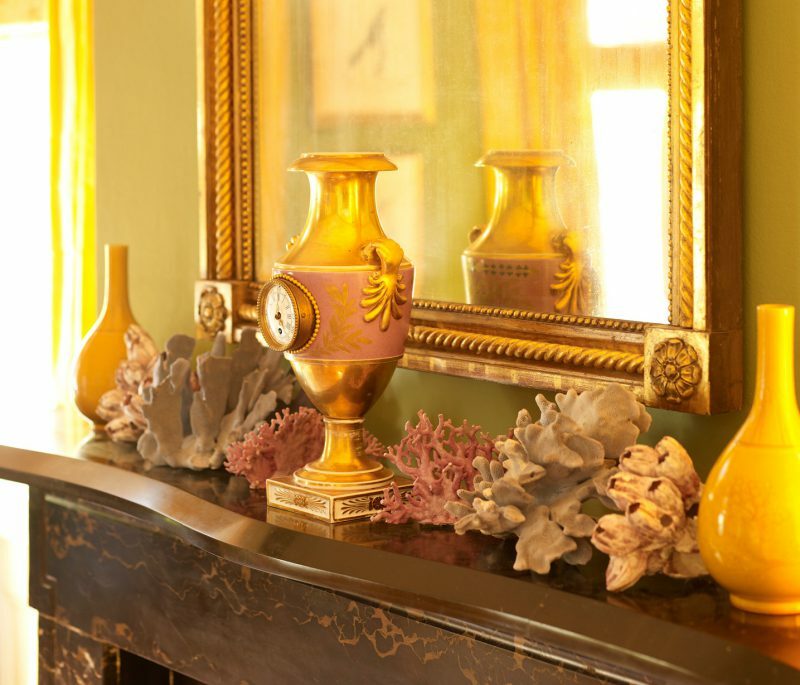 The garniture on the front parlor mantel is a Paris porcelain vase fitted with a clock and collection of seashells. The back parlor, where some of New Orleans’s great jazz musicians have been known to play, is loosely furnished with club chairs covered in Le Manach chintz, a rare Colonial armchair, and a piano displaying a sculpture of a golden catfish, which came from a Mardi Gras float. 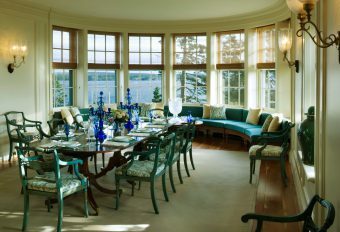 The dining room decoration is centered by a settee from Julia’s grandmother’s house in Nashville decorated by Herbert Rogers. 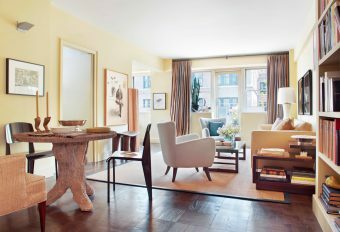 The restored piece has traveled with Julia, first appearing in her New York apartment. 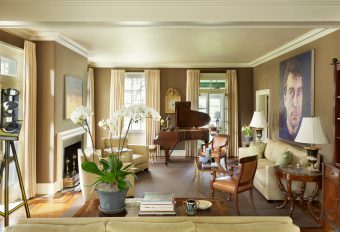 The color for the walls required several trials –as the great decorator Albert Hadley counsels, sometimes a room has to be painted several times before it is right. 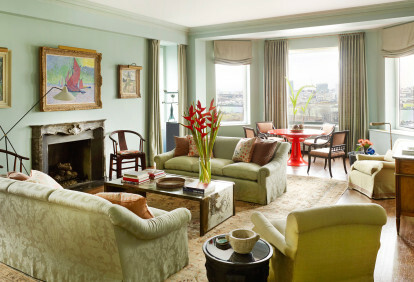 We worked with several paint decks and in the end found a great color – a blue green that certainly decorates the room. The other room on the first floor is the library. Added in the 20th century, its relatively modest scale calls for a quieter decor. 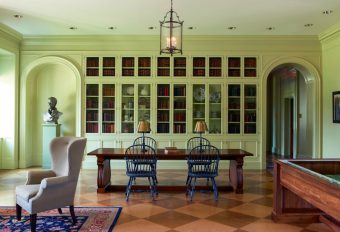 The walls have been grained to resemble pine, the insides of the bookcases are painted a pale blue and the curtains are gently patterned in gray, green, and rust. This retreat is a restful counterpoint to exuberant decoration in the neighboring rooms. 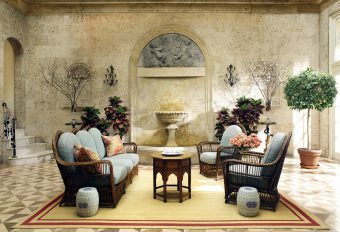 We often make front halls relatively neutral as an introduction to the more elaborately decorated rooms that follow. Here it also highlights the period architecture of the house, including the original staircase.